Shimizu Corp., a major Japanese construction company, announced on February 21, 2012, the launch of construction of a zero-energy building (ZEB), the first in Japan. Called the "Office in the Forest," it will be built in the city of Hokuto, located in a forested mountainous area, in Yamanashi Prefecture. Making use of local characteristics, the company aims to realize a "zero-carbon" building completely self-sufficient in electricity by using renewable energy sources. The building will be a two-story wooden structure with a total floor area of over 8,000 square meters. The client that has ordered the construction of the building, Seicho-No-Ie, is Japan's first religious institution to obtain ISO 14001 certification for environmental management, further advancing a "carbon-zero" campaign. In this context, Seicho-No-Ie has adopted Shimizu Corp.'s project to realize a zero-emissions wooden building and minimize environmental impacts in the construction process. By using natural ventilation and solar heat collection systems, the building's cooling and heating loads will be reduced, and its electrical load for illumination will be reduced by using light-emitting diode lamps and placing windows in the most effective positions. By adopting these energy conservation technologies, the company aims to reduce the building's use of energy by 45 percent compared to conventional buildings of the same scale. Moreover, by establishing an energy self-sufficient system using micro-grid control technology, the company intends to have a building that is completely energy self-sufficient, through means of using large-capacity batteries, in combination with electricity generated by photovoltaics, biomass, wood pellet boilers, and other new energy-generation technologies. 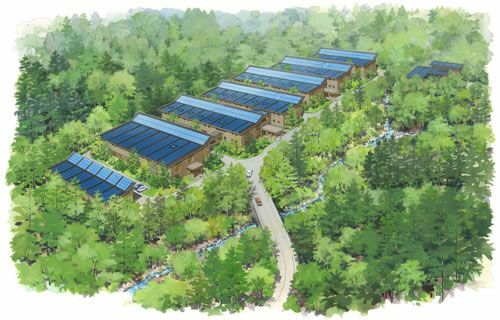 By using the area's local timber, certified by the Forest Stewardship Certificate (FSC), Shimizu aims to obtain a FSC Project certification for this project.